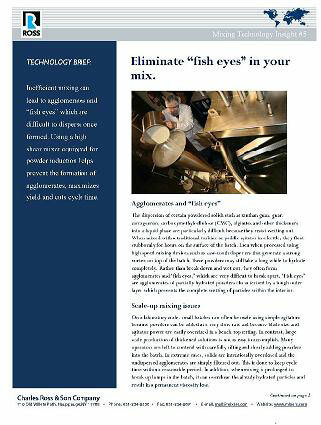 The Ross "Mixing Technology Insights" provide many useful tips and techniques on dispersion, dry blending, emulsification, homogenization, particle size reduction, high viscosity mixing, sub-surface powder induction, sanitary mixing and other topics. Each two-page bulletin includes a sample application or mixer installation from various industries. Solutions to improve the processing and manufacture of adhesives & sealants, batteries, electronics, chemicals, ceramics, metals, cosmetics & personal care products, food, inks, paints & coatings, pharmaceuticals, plastics and composites are discussed. Established in 1842, Ross designs and builds specialty mixing, blending, drying and dispersion equipment. Today, its worldwide manufacturing operations are spread throughout eight state-of-the-art facilities in the US, China and India. As part of the company's commitment to provide its customers with up-to-date information covering mixing technologies and techniques, the new series of technical insights is offered free at the Ross website where white papers, videos and archived webinars can also be accessed. Ross likewise offers no-charge mixing demonstrations at its Test & Development Center located at the company headquarters in Hauppauge, NY.